The bestselling gel claims to work miracles on puffiness, wrinkles, and under eye bags, too. No one likes having dark circles under their eyes and many people feel that they make them look tired, older, or unhealthy. And even if you routinely clock a solid eight hours of shut-eye, they age the face and make you look tired. According to the Mayo Clinic, everything from allergies and eczema to fatigue, aging, lack of sleep, and genetics can leave you with so-called raccoon eyes. We all know that the right concealer can help lessen their appearance. However, only a good eye cream for dark circles can actually help remedy the issue (albeit temporarily). There are thousands of eye creams on the market to choose from, though, but generally they promise to solve one or two specific issues, like boosting elasticity or minimizing wrinkles and crow’s-feet. However, very few products have been tried, tested, and praised as much as Baebody Eye Gel for Appearance of Dark Circles, Puffiness, Wrinkles and Bags , a #1 bestselling product on Amazon with a whopping 13,000 reviews on the site – 8,000 of those reviews come with a 5-star rating. Baebody Beauty claims the gel helps fight all of the undereye woes — including completely getting rid of dark circles – while lifting and hydrating the delicate skin under your eyes (one of the most sensitive areas of the body). And the majority of reviewers say the formula lives up to these claims. Obviously, Baebody Beauty Eye Gel isn’t actually magic and can’t work for everyone. The reason for that is because dark circles are usually genetic, which means there’s no cream or gel that can actually get rid of them. However, it’s fair to say that customer reviews can make a big difference in whether or not you end up adding an item to your cart, especially when it comes to skin care. So why the hype? What makes the Baebody eye gel so popular? For starters, the best-selling gel is formulated with so many great ingredients, which reduce puffiness and dark circles around your eyes, adding hydration, brightness and firmness. The dermatologists’ favorite hyaluronic acid, which works to moisturize and hydrate skin while preventing wrinkles and minimizing fine lines. Eye Gel also contains Vitamin E and plant stem cells, which, along with amino acids, keep skin strong and healthy and protect it from the damage that UV rays can cause. The main ingredient of Baebody Eye Gel is Matrixyl 3000, which is made up of stem cells in order to help lift your skin, making it tight and firm. The gel also contains organic licorice, which helps diminish the appearance of dark circles and helps to brighten the skin. It’s important to note that Baebody Eye Gel is not tested on animals and is formulated without any parabens or synthetic dyes or fragrances. According to a large majority of reviewers, the Baebody Eye Gel seems to produce more immediate and dramatic results for women who have puffy eyes. The gel seems to work well on depuffing the eye area and making the eyes look less tired. All you need to do is to gently dab the gel around the eyes, forehead and cheek area. Results seem to be more intense after using the product consistently for twice a day (morning and night). “After using the product twice a day for a couple weeks, I was delighted with the results. Over the past month of use, the fine lines under my eyes are appreciably less noticeable. Even the deeper crow’s feet have softened,” writes ederath. One more thing worth noting is that the gel, unlike other eye creams or gels that can leave the area around your eyes feeling sticky or stiff, doesn’t feel greasy or heavy on the skin, either. 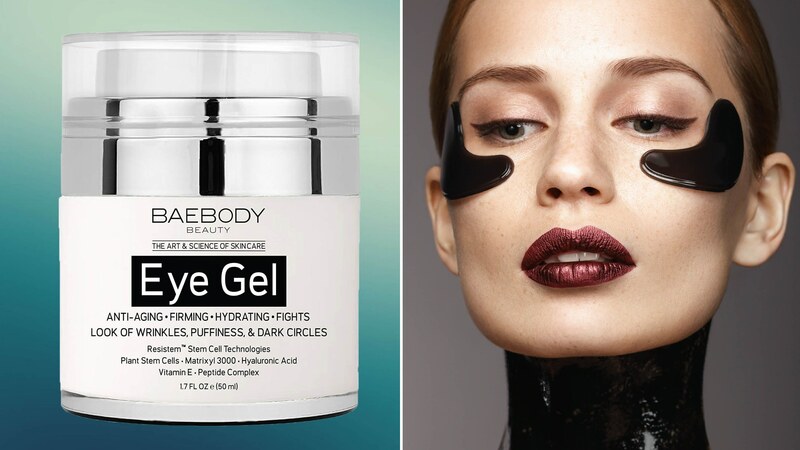 Baebody Eye Gel feels “light and smooth” and soothes puffy eyes as “effectively and gently as cucumber slices, but without all the mess,” according to reviewers. An affordable price tag is another positive, according to many women who use Baebody Eye Gel. “This is one of a handful of products I have tried over the years that actually help with the puffiness and dark circles, but [it] is the only product that is priced this reasonably,” writes Amazon user Judith Rizzoli. Even the packaging of this gel is amazing and gets its fair share of love among Amazon customers. The product is dispensed through an air-tight pump, which means that unlike other gels and creams that require you to put your fingers in the tub, it makes less of a mess. The pump also prevents bacteria growth and does a great job ensuring that the product doesn’t oxidize. Incorporating this formula in your skin routine will help you to maintain proper skin hydration, making it to appear revived and more vibrant. It will also help you get rid of fine lines, eye bags, crow’s feet, dark circles and reduce puffiness. Baebody Eye Gel is an advanced skin care product, which is made using natural and potent ingredients, which are considered safe for the delicate skin around the eye. This gel also has antioxidant properties, which means that it will help to protect your skin cells from damages. Baebody Eye Gel is made by the Baebody Beauty brand, a company that promotes using natural products combined with a healthy and active lifestyle to become the best, most balanced version of yourself possible in order to look and feel amazing. This formula will help you to improve your skin health, maintain proper skin hydration, protect skin against damages and fight the visible aging signs. It is recommended for a smooth, soft, glowing and more vibrant skin. Should you actually be in the market, there’s no safer bet than a product with a $15 price tag and the reassurance of over 13,000 reviews on the site, and 8,000 of those reviews come with a 5-star rating. The Baebody Eye Gel is well worth a look and for less than $20, you can’t find a much better eye gel on the market. It makes a wonderful gift for family and friends at Christmas and Birthdays.